This is my first ever bladed tool, have never mad a knife or anything meant to hold an edge but I have need of a draw knife so I figured why not just make one! It is forged from a portion of leafspring off of a ford raptor. Not knowing exactly what type of steel it was I cut a small piece and heated it to forging temperature a few times giving it a few hits with a hammer each time, then normalized x3, then heated until non magnetic (my high temp thermocouple hasn't arrived yet) and quenched in mineral oil. It hardened to the point I could snap it in a vice with a very light tap from a hammer and it showed a very very fine grain. This all seemed to point to it being reasonably quality carbon steel and that my heat treating process was sound, on to forging! it is about 1/4" thick along the spine, and I have hand hammered the bevel to a relatively consistent point. I did three normalizing cycles and this is the product so far. Looking good so far! Are you going to leave the tangs straight out or bend them in towards the edge? 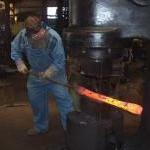 It never ceases to amaze me how cool it is to just be able to make the tool you need - gotta love blacksmithing! If the blade was less wide, and the ends are not bent, it would resemble a push knife. (that tool is a close cousin to a draw knife). I will be bending the arms (not sure if that is the correct term) The blade is about 8" long and each arm is 5 1/2 inches. Well, at least you'll remember it now, so let us all sing with Bob Hope: "Tangs For The Memories!"